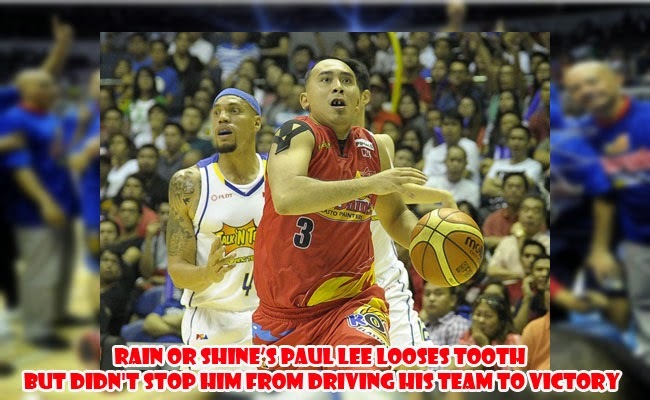 Rain or Shine’s Paul Lee did not let losing a tooth stop him from driving his team to victory on Game 3 of PBA. He may have lost a tooth in the third quarter but came back in the half of fourth quarter to finish the game. After the game had concluded, Rain or Shine’s coach, Yeng Guiao had asked the referees for the consistency because the games in the final series are getting more physical. Ha said that though Lee lost a tooth, they won the game but the series is getting more physical as in continues. He said that referees need to be consistent and control the problem. He further explained that it is fortunate that Lee only lost a tooth but he could have injured his nose and the referees seemed to let things pass up. Lee was injured as Ivan Johnson’s elbow his his mouth. The incident was called with an offensive foul. He was immediately escorted to the locker rooms to have the doctor check the bleeding and they said that two of his front teeth sank deeper into his gums. Despite the injury, the Rain or Shine guard went back to the games with 4:15 minutes remaining in the game. He played until the end of the game and ensured the win with 109-97. Lee shared that his went back to the game to make his teammates see his determination to play the game. He wanted to risk everything to secure the second championship win for his team. Even though it means getting hurt, he will come back to win. After the game, he had his teeth checked out in the hospital. On the other hand, this is not the first physical contact by Johnson against Rain or Shine. He had been fined with Php 150,000 after knocking Guiao in the Game 1 sidelines.